Growing up in San Juan, Juan “Juango” Gutiérrez studied music at the University of Puerto Rico and the Conservatory of Music in San Juan before moving to NYC in l976. He continued his music education at the Manhattan School of Music and at Lehman College, where he received a Masters in Music Education. After a career as a successful Broadway percussionist and arranger, he devoted himself to the study of the Afro-Puerto Rican music traditions of bomba and plena. In l983, with renowned plenero Marcial Reyes Arvelo, he formed the group Los Pleneros de la 21 (LP21) and became it’s musical director. A recipient of a National Heritage Fellowship, Mr. Gutiérrez has performed at major music festivals and events throughout the world. 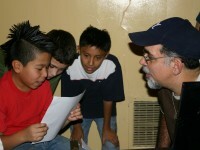 He has been a public school music teacher and teaching artist in New York City public schools for over thirty years.